There are so many musical genres we wouldn’t have, if we didn’t have disco. The rise of remixes, the invention of electronic dance music, and the foundation for hip-hop could easily be laid on the floor that disco’s “four-on-the-floor” beat placed. What make the disco beat so utterly essential to know is for this reason only: anyone can dance to it. The heart of disco music is a steady kick to kick+snare (or handclap) pattern, played in 4/4 time, accentuated by a steady 16th or 8th note hi-hat/shaker pattern that shifts on the off-beat. This is what gives disco it’s easy-going swing. Arguably, it all began with Tom Moulton’s, at then ludicrous, idea — why can’t these short, three minute, R&B cuts he’d play on the dance floor keep going for longer, right when the audience was starting to feed off the groove? On B.T. Express’s “Do It (‘Til You’re Satisfied)” Tom put on record what he had done on tape, splicing and repeating, the steady drum groove from the original three minute cut, until he nearly doubled its track length. In doing so, at that moment, disco was born. 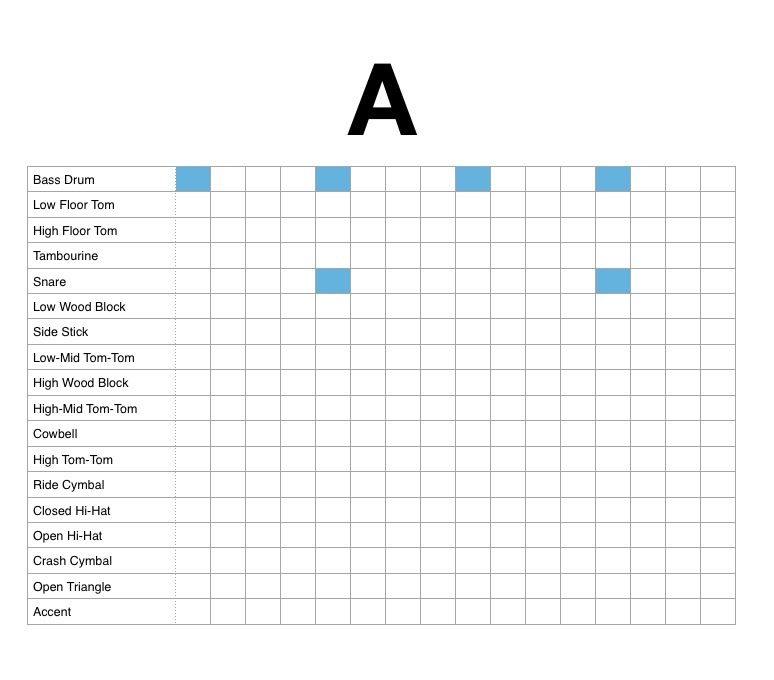 Just a refresher, in case you haven’t gone back to the Beat Connection archives, what we’re going to use to help you create beats is something called Grid Notation. If you don’t know what Grid Notation is, be sure to check out the first post in this series which you can find by following this link. 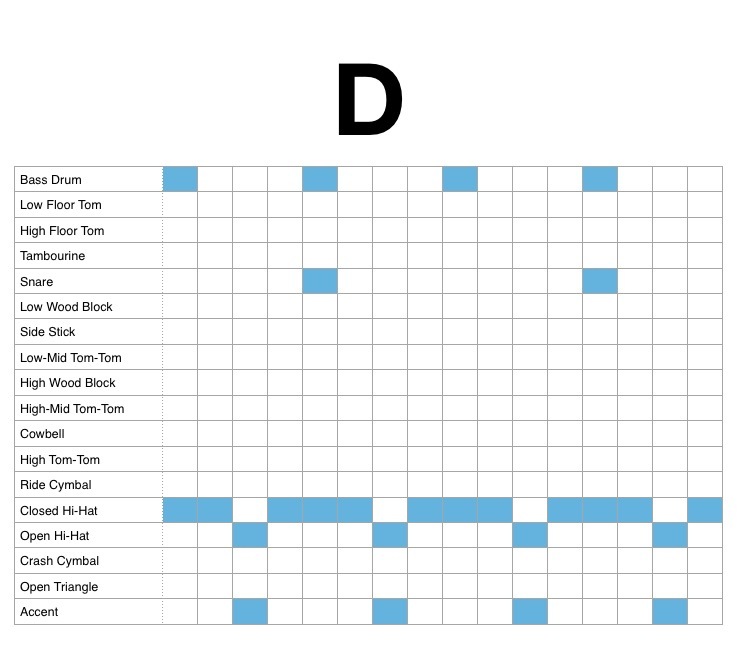 By understanding and sequencing the following three drum patterns (A, B, and C) you should be able to expand upon each by adding additional parts, removing hits, or layering other instrumental grooves over them. Straightforward and very musical, you can almost hear the sound of a roaring guitar getting ready to wail over them. As always, the A section will correspond with the main pattern which normally the verses or main melodies play over. The B section will correspond with the groove you’d normally hear playing during the chorus or pre-chorus of a song. Finally, the C section will always correspond with the break in a song. C sections are perfect for building bridges between song sections or to break up the monotony of any other sections. 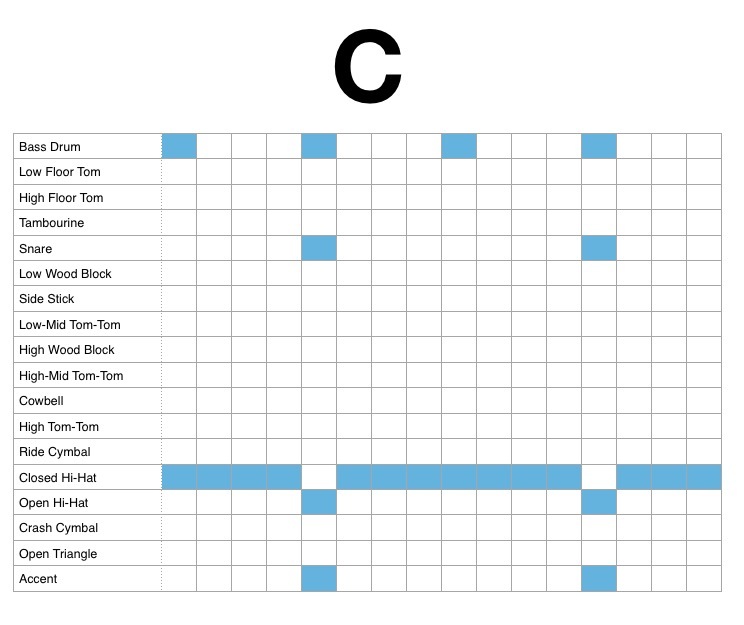 If you need any refresher on what A, B, and C sections mean (and how songs are built using patterns) be sure to check out this previous Beat Connection post explaining the ins and outs of Song Structure. Disco rhythms command any dance floor because of the way governed by a constant throb. One bass drum every four beats. One snare or clap hit every eight beats. In essence, it goes back to aeons old call-and-response ideas found in African and American soul music of all stripes. In this case, the disco beat places emphasis on the denouement, ending or shifting on the upbeat of a groove. Syncopation — the final aim of disco producers — allows a steady groove to gain some hypnotic pull, even though the rhythm rarely changes, via repetition of this call-and-response. Note: the tempo in disco music tends hover around 110-120 BPM. Go a bit slower than this tempo and you make the track slinkier, sexier. Go a bit faster, and you’re bound to bust the song loose and make it an uptempo barn-burner. There’s something truly decadent about a disco rhythm. In other styles, you get that feeling of wholeness, of completeness, via intricate across-the-drum patterns — not so with disco. Disco gets its lushness via the ride, disco gets its groove via its hi-hats. Played every sixteenth note, notice how the steady, closed hi-hat pattern shifts abruptly to strike an open hi-hat on the off beat. That’s the key to the whole disco groove. By accentuating the off-beat of a straight “four-on-the-floor” rhythm, disco allows other instruments to come in on that off-beat and assume the role of swing. The more lush the music gets via tasteful, musical restraint, the more these other rhythms play off that off-beat. Bass lines are particularly important in melodically moving the song forward. Disco rhythms do one thing well and that’s shift. Rather than rearrange whole drumming patterns, disco grooves simply shift the accent of the beats. Sometimes you go off and loose, like in disco rhythm B. Other times you bring the dance floor back to the one. Sometimes you place the accent right on the beat — to reinforce the overall composition as it’s done in disco rhythm C. As always, it’s not the kick, snare, or claps you vary in this bit, but the pitchier percussions like hats or toms. We end on this final rhythm that shows the beauty of disco rhythms. 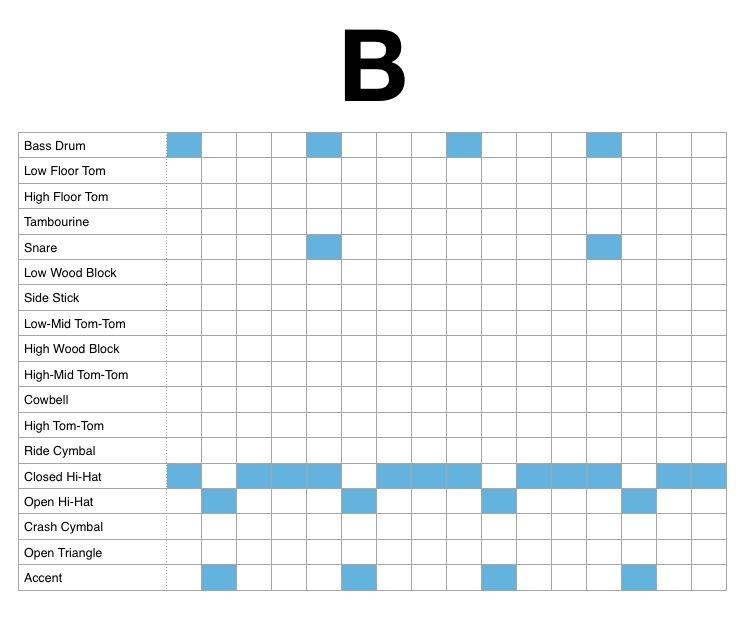 If you’ve noticed a recurring theme, simply by looking at these patterns, there is one: it’s how the role one hit can play to provide sonic movement to each groove. If everything else remains static, it’s easier for a dancer, or a composer, to really notice the subtle shifts in rhythm, called out in such changes (expected or unexpected). Disco rhythms always go back to subtlety. Drummers may not be playing much, but what they do play, and how or when they play it, matters immensely. As always, here’s where I leave you with an example of what you can do with these foundational rhythms. Using the same patterns, I’ve created an Ableton Live session which you can download below, that uses the Kit-Core Formaggio 2 drum rack (available for free in the full version of Ableton Live) to create an actual song. This kit captures the slightly metronomic sound of early drum machines favored by all sorts of Italian and American producers to create electronic disco. 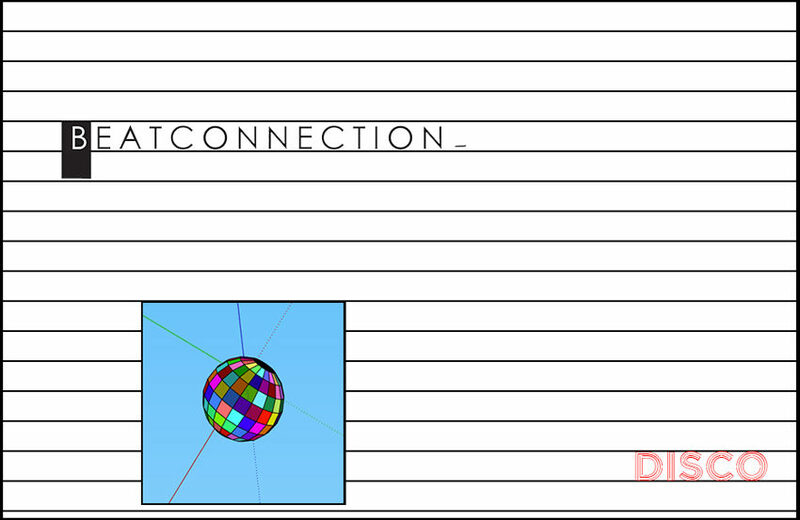 With a starting point to begin with, now I tried to capture the drama and groove of a memorable disco song. All the embellishment is driven by syncopation. Bass melodies playing off harmonies, harmonies segueing to new melodies — simple, classic disco technique. All images and sound samples by author.